Translation of one of Jari Parantainen‘s two compositions written in the spring high school graduation exam in the subject of Finnish language in 1980. The exam is also known as Matriculation examination. He was 18 years old at the time. Parantainen published this writing on his blog Pölli tästä on April 14, 2014: Mainosten nainen ja todellisuus. Suomen Kuvalehti awarded this together with five other essays with dictionaries. These six were shared national second places; the best essay was given a monetary award by the Finnish Cultural Foundation, which Parantainen had set his sights to. 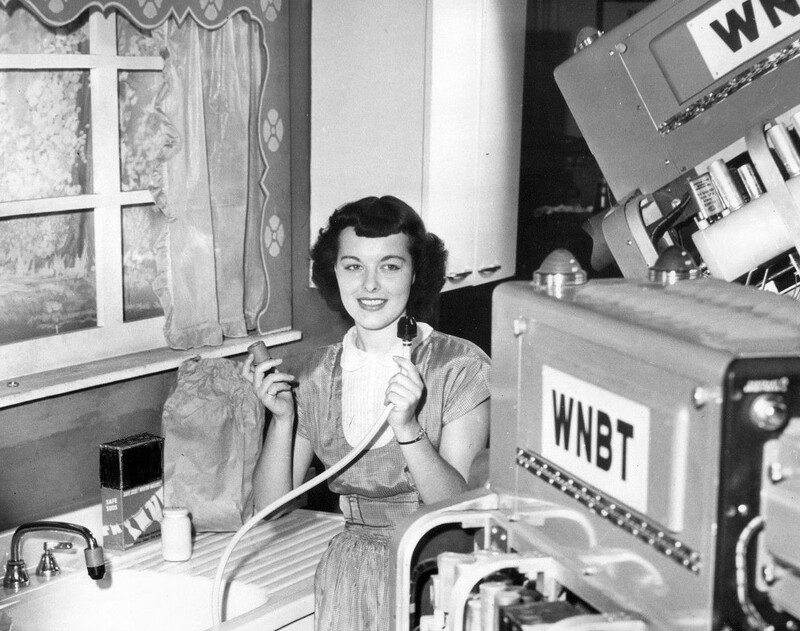 Photo of a 1948 television commercial. When a single mom sees the supermarket girls talking and giving advice and incentives on the television, her impression may be far from feeling commercialized. In a real supermarket the mother is hardly able to find the apples quite so shiny or those ham slices shown without the white rim of lard. To finish off her shopping she gets a scolding from the cashier for not weighing a bag of fruits herself. Those rosy-cheeked cashier ladies do not really exist, their cheerfulness and helpfulness being a product of large swaths of money: each minute of commercial costs 60,000 marks (Finland’s pre-euro currency). For the commercial to pay itself back it must excite even the unmovable Finnish lumberjack – and soon there is a waft of that blue aftershave by the tree line. The advertisement worked, because it created an association in the mind of this woodsman that connected a certain aftershave with a beautiful young lady driving a sports car. That woman is far-removed from the what he encounters in his own kitchen. His wife is all too familiar to him and usually doesn’t really electrify his imagination anymore. A new scent on his cheeks doesn’t, of course, change any of that; it is but a glimpse of the Great World which the advertizing company has piece by piece created on a drawing board. The best kind of a lie is one with a hint of truth, for in this way the lies disappear like trees in a forest. The panorama offered by the commercial is well-planned and its ingredients are carefully shifted. One woman may have beautiful cherry lips and another a charmingly narrow waist, but when these features suddenly come together with a half a dozen other appealing characteristics through a diffusion filter, it is no accident. When professional choreography and acting, Miss Universe, consumer psychology and a talented producer are crammed into the same studio, the result is a very manipulating (often unawares to the viewer) synthesis on film. It depicts a perfect woman in a romantic or sporty environment. She is part of the elite with impeccable teeth. There may be around her typical signs of high-end living, like two doberman dogs and a pool. The stay-at-home mother watching the commercial is implanted with this model of living, of being such a successful beauty. And she is now offered the very key to this new world: obviously it is this night creme! The husband, for his part, would like to see in his life a glance of that alluring elite lady from the commercial, so he quietly hides a small jar of that anointment among the Christmas presents. All happiness doesn’t come through when it is discovered that the concoction has a disturbingly strong odor of daisies – and that it smears the bedsheets pink. Many products besides cosmetics are advertized using feminine wiles. Even the advertizing industry has become aware of the unrealism of the successful beauties in commercials. The ad agency has now planted the product back on earth: in the home. The camera focuses on an ash-grey bathroom and a desperate hand-wringing old cleaning lady. An appropriate contrast is given in the form of a young wife who with a single sweep removes the grime. But she is using a brand new power cleanser that is sold in a plastic bottle that has a new impressive shape. The sweat becomes associated with “the other cleaning agents” where as the broad smile and shortish skirt become one with the new wonder cleanser. However, cleaning a toilet is always work regardless of the brand of the used solutions. Commercials are not lauded by feminists because they propagate gender roles that have now become old-fashioned. The woman in an advertisement stands by the stove cooking frozen fish for a dinner for her husband and is depicted happy in that role. These kind of roles are also treated with sarcasm in modern advertizing but more often a woman is still shown as some kind of charming servant for the man. The woman in a commercial is a fantasy as she is pleasing the man with her mere existence. This doesn’t go unnoticed by other women. Young female consumers set that picture from advertisements as their objective, but unfortunately that woman is only a fictional character. The image presented by advertizing industry is as if captured from a spinning kaleidoscope. The studio manager has whisked it together, creating a magnificent scene that is captured before it collapses again. This snapshot is what is present as if it were something stable and within everyone’s reach. In reality, even the model from the commercial blows her nose after the shoot and then takes the subway home and after a brief rest starts on her own house chores.